The knapsack blower, SB03 model, distributed under "Piritec" trademark, has been studied by Cifarelli SpA for fire figthing use. 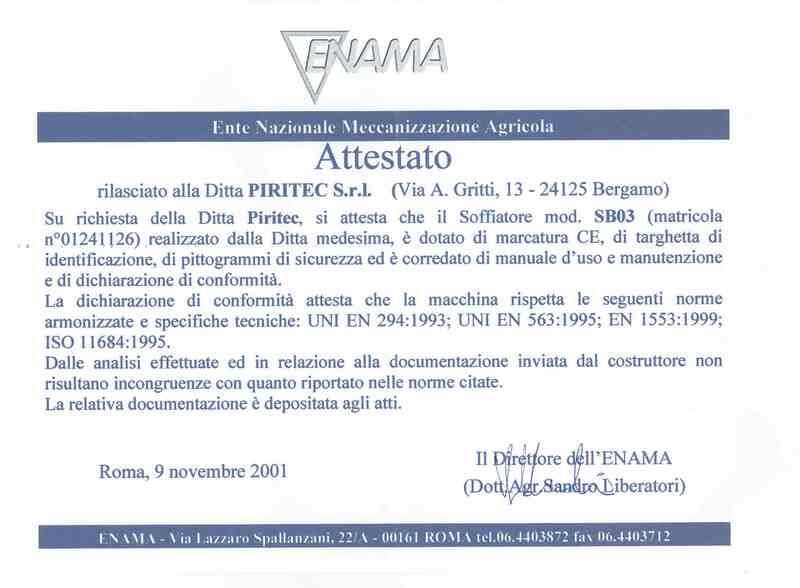 The certificate, issued by Enama on November 9th 2001, attests the correspondence of the equipment with the following norms: 98/37CEE Directive (repeals and includes 89/392/CEE, 91/368/CEE, 93/44/CEE, 93/68/CEE Directives), 89/336/CEE Directive, UNI-EN 292/1/2, UNI-EN 294:1993, UNI-EN 563:1995, ISO 11684:1995, EN 1553 dated 06/99. The equipment bears CE mark according to the Italian Decree by the President of the Republic 459/96 and it's supplied together with a technical manual which provides for the analysis of the specific risks for the fire figthing use. "Instructions and Maintenance" manuals with safety procedures (drawn up by fire figthing qualified people).